Home / News & Events / When You Dance Many Good Things Happen, But On Day 3 of the ASC Seniors Games During Bocce & Billiards… Some Great Things Happened! When You Dance Many Good Things Happen, But On Day 3 of the ASC Seniors Games During Bocce & Billiards… Some Great Things Happened! This year our theme is, Dance! Dance Dance! With dance there are many good things that happen: improved physical health; increased emotional well-being, and even; making a new friend or two in the process. 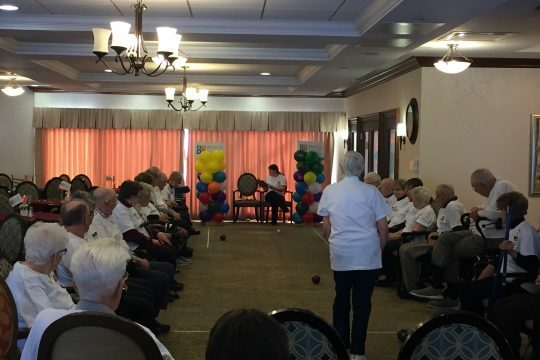 Day 3 of the 2019 All Seniors Care Seniors Games action was exciting across the country today, as Billiards and Bocce tournaments were contested. With competitors engaging in friendly competition while competing for medals and bragging rights at 26 retirement communities across Canada. The day was full of tension, excitement, cheers and laughter. At the Laurel Heights Retirement Residence Billiards competition Gold Medalist Harvey suggested with a twinkle: “Who will take the second shot in this snooker game? Find out after the break.” Then at The Courtyards on Eagleson in Kanata Ontario, after the first round of the bocce playoffs and sensing some stress in the room resident Jean M. showing displeasure with her score, quipped “oh heck, well, I’ll be back next year” Jean ended up winning the Silver medal today! National medals will be awarded at a special presentation during Closing Ceremonies on Friday, Feb. 8th, 2019. Media are welcome to attend all events. Congratulations to all medalists, competitors and spectators alike. Our week so far has been amazing. And a special thank you to our Mission Staff, Billiards and Bocce volunteer assistants, and our Health and Wellness staff at each residence, whose hard work has made the Games possible. The Seniors Games are part of the All Seniors Care commitment to providing seniors with innovative ways to enjoy an active and healthy lifestyle. Wii Golf & Shuffleboard – Round robin play in the morning with Finals in the afternoon followed by Medals Ceremonies and entertainment. All Seniors Care Living Centres Ltd., where caring is our number one concern, has become the new standard of excellence in luxury retirement living. Founded on an unwavering commitment to exceptional care, All Seniors Care is dedicated to creating and operating the best senior’s facilities, while providing the highest level of care to our residents. As part of our commitment to Aging-In-Place, residents and their families can expect enhanced independence, greater peace of mind, and higher quality of life throughout the years at these beautiful facilities. Our Directors of Health and Wellness lead daily activities designed to challenge, inspire and entertain while our Red Seal certified chefs carefully plan each meal to ensure all residents enjoy delicious, nutritiously balanced culinary creations every day – hallmarks of our commitment to excellence in providing gracious retirement living.